A hugely popular Northeast Tallahassee neighborhood in the 32309 zip code is Killearn Acres. 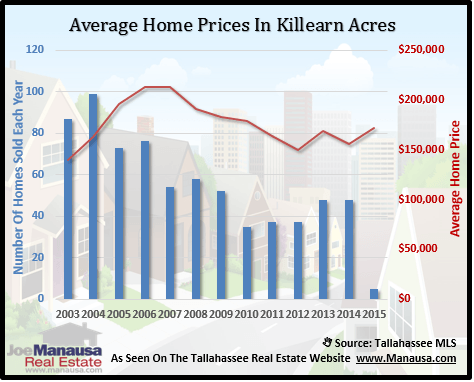 It can often be said, as goes Killearn Acres, so too goes the Tallahassee real estate market. This is especially true today. Currently, there are 23 homes for sale in Killearn Acres, and buyers will be pleasantly greeted by 2002 home valuations. You can find homes priced from $109,900 all the way up to $225,000, but the current average sales price is just over $132,000. Imagine, it's like going back 10 years to buy a home, accept this time you get incredibly low interest rates. 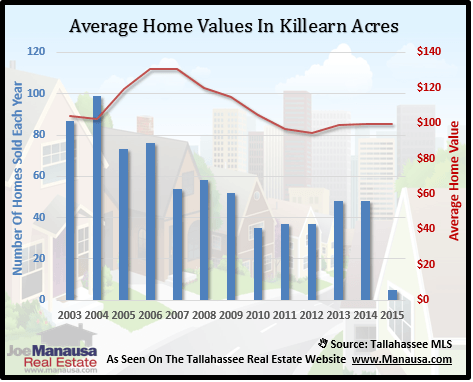 Our first real estate graph shows that average home prices in Killearn Acres have fallen 38% since the peak of the housing market. Also, note the rate of growth of distressed property sales (4 out of 6 sales this year) as a percentage of the market (red is distressed, green is arms length). Home values have declined in a similar manner. Though we don't have specific data for 2002, it is obvious that values have dropped back to 2002 or even prior. The key will be to monitor new lis pendens filings and foreclosure activity in Killearn Acres. If we see a continued rise in activity, we will know that pricing pressure will remain a constant for the foreseeable future. As with any other neighborhood in Tallahassee, home sellers need to utilize a smart plan of action to ensure that they get top dollar in this declining market.